Snakes — they’re slithering on the ground, climbing trees, and now they’ve taken to the deep sea. 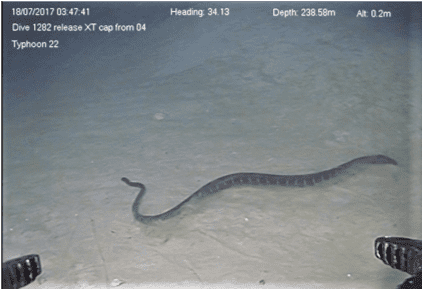 A team of Australian researchers spotted two snakes swimming at depths of 239 and 245 meters, respectively — smashing the previous record by a whopping 133 meters. Record-setting dive of a sea snake swimming at 240 meters in the deep-sea ‘twilight zone’ taken in July 2017. Image credit: INPEX-operated Ichthys LNG Project. There are more than 3,000 snake species on Earth, and there’s at least one on every continent except Antarctica. They come in all sizes, ranging from a meager 10 centimeters to a whopping 10 meters (in the case of the reticulated python). They also inhabit an impressive array of habitats. Most live on the ground, but some are arboreal, and some even dwell around caves. There’s also a group of sea snakes. Sea snakes are a highly venomous family inhabiting the warm coastal waters from the Indian Ocean to the Pacific. They dwell almost exclusively in water, and most of them are completely unable to move about on land. They’re excellent swimmers, being capable of swimming several kilometers in one go, and they also dive to search prey. However, they still need to breathe, and researchers thought they only dive to shallow depths. Until now. The snakes were filmed in 2014 and 2017 using a remotely operated vehicle (ROV). The fact that there were two separate observations of two different species suggests this is not a freak occurrence, and sea snakes are quite capable of diving to these depths. Water pressure is also substantial at that depth, and for surface creatures to go that deep, you need very specific adaptations. The temperature is also quite low — which is quite challenging to cold-blooded creatures like snakes. This raises new questions about the thermal tolerance and overall ecologic capabilities of these snakes. This also highlights the need to better understand these environments, which are at risk from climate change, ocean acidification, and human activity — better conservation first requires better understanding.